It don't get no better. Got the surfers, got the pier, got the ultimate reason for a topout (and one that costs peanuts because it's so thin) got the pretty, but clean cut girl, and as a Double-wise person once said, "People rent hotel rooms at night." 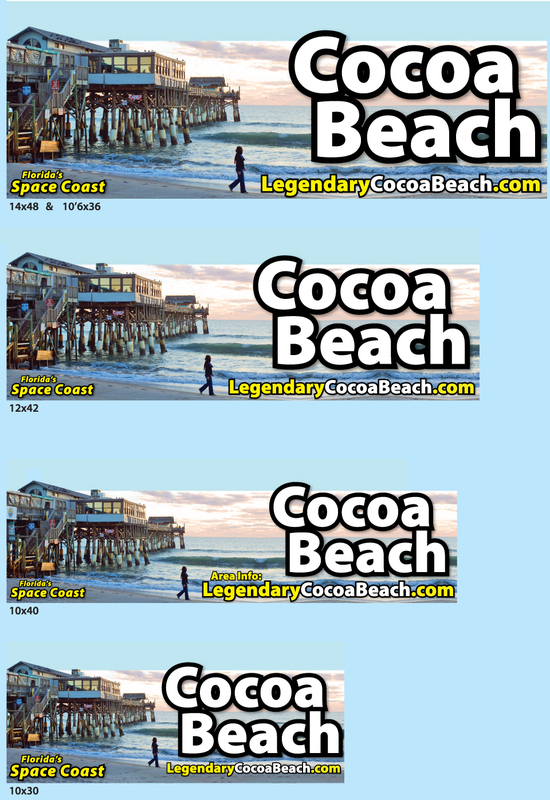 Yes Virginia, there are things do do at night in Cocoa Beach. Get a room. Only good port picture. Will be extra of these printed. I-95 Version. Perfect for those I-95 boards hidden in the woods you only see for a second, after you've gotten the best board on the road in downtown Jacksonville. In that fleeting moment, it gets your attention, something primal about those looking at you. 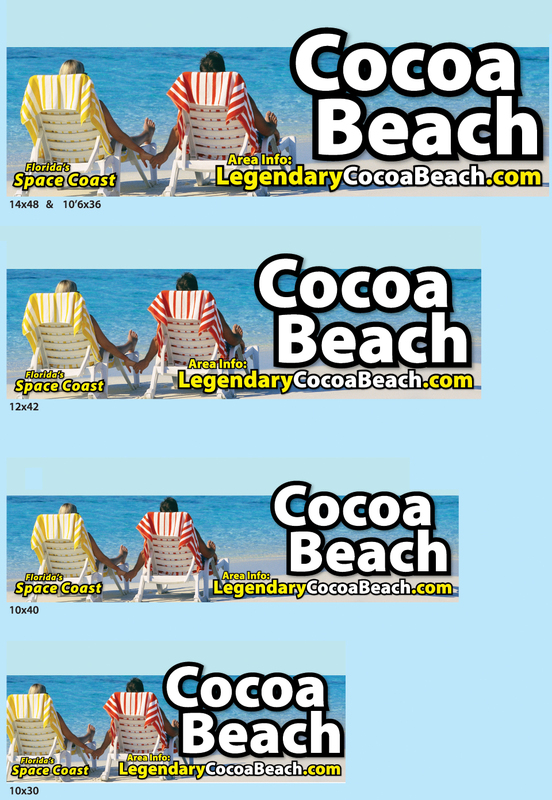 And the simple most easy to read possible message...Cocoa Beach. This was the all time favorite the first year, many moons ago. Everyone talked about it. Topped out too occasionally, but not with all the subtle detail and hand of the artist below, not to mention the huge topout. 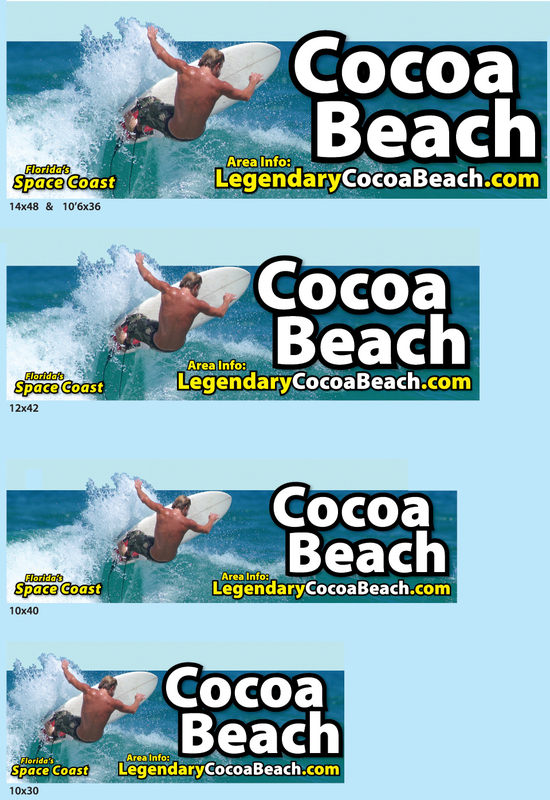 Best obligatory surf splashing out of a billboard ever seen in the Sunshine State. A severe test of the Topout maker's art. 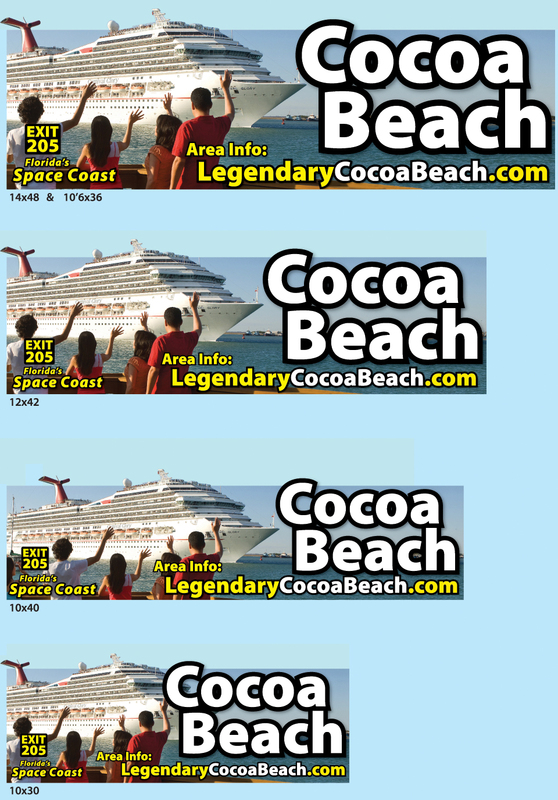 Nice Billboard Companies. This is the primary blue surfer billboard, the other is for in areas where there are so many billboards that this one would be duplicated. Had to chase the birds off the roof, and catch the wave. Nice colors too. Walter Mitty walking on the beach. And the perfect reason for a topout, really works including the very subtle topout on that little part to the right. Did I mention people rent hotel rooms at night? Get a room. Not shown, due to shortage of clock cycles at the moment... Such a gigantic image. Did I mention people rent hotel rooms at night and that you need to get a room? Girl you wish was next door. Supernatural high resolution image. This one goes anywhere people can see it close up. Sneaky trick makes it 10-100 times bigger than the typical billboard photo. Even the Hubble couldn't take that picture. Text always dead smooth a line no matter how big, but the photos, if you look close, printed billboard size, are blurry mud. Not this one. A test of the limitations of billboard printers, and it's the best possible quality this year. She's shown there 16 feet tall, and with legs pushing 30 feet. Seemed like a good idea at the time, nice colors, cute holding hands, but can't see the hands, in the shadows, and kinda blah compared to the others. Emergency reserve.